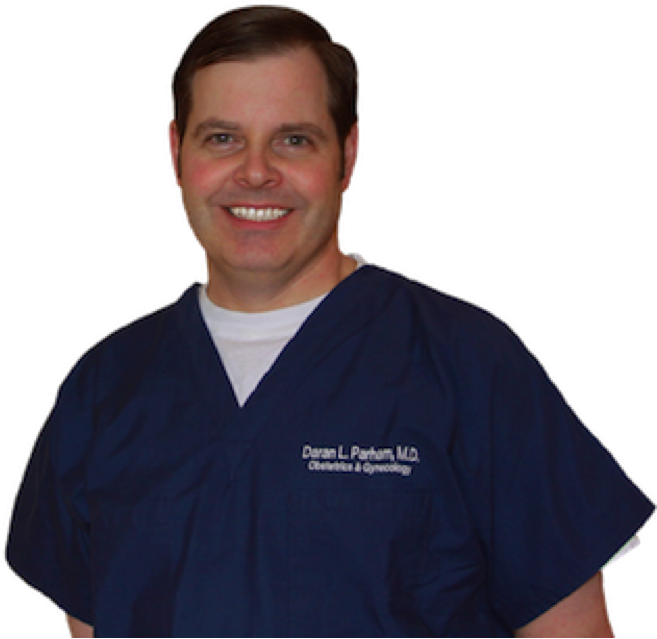 A native of the Tulsa area, Daran Parham has been in practice as an obstetrician and gynecologist for over 18 years. Dr. Parham takes pride in providing the most compassionate care possible to his patients, while allowing ample time to answer his patient's questions and address their concerns. In 1986, Daran Parham graduated from Owasso High School. He received his bachelors degree in Zoology from the University of Oklahoma in 1990 and his medical degree from the University of Oklahoma College of Medicine in 1994. He completed his residency in Obstetrics and Gynecology at the University of Oklahoma College of Medicine in Tulsa in 1998. Dr. Parham is board certified by the American Board of Obstetrics and Gynecology. He is also trained and certified to perform gynecologic surgery utilizing the da Vinci robotic surgical system. Dr. Parham is also a member of the Oklahoma State Medical Association and the Tulsa County Medical Association. On a personal note, Dr. Parham and his wife, Candace, have been married for 25 years and have 3 children. Family time with his wife and children bring Dr. Parham his greatest joy. As a family, they enjoy traveling, sporting events, movies, and just listening to each other. In his spare time, Dr. Parham enjoys walks with his dogs, reading, watching college football and BASEBALL of any kind.